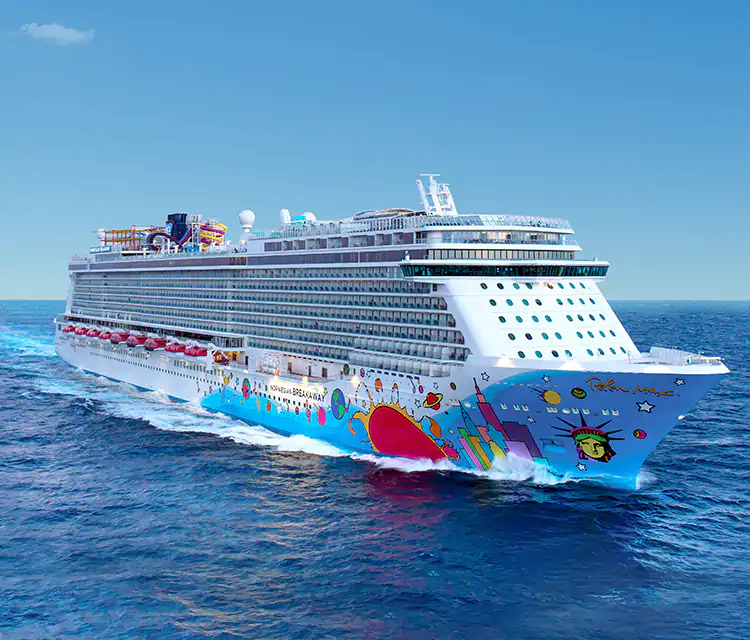 Description: Norwegian Breakaway is ready to whisk you away to your best holiday yet. Take a Caribbean cruise and swim with dolphins, step back into history on a Europe Cruise, or just enjoy relaxing days on a Transatlantic voyage. Named Best Cruise Ship for Families by USA Today, there’s something on board for everyone. Breathe in the fresh ocean air and connect with the sea like never before along The Waterfront, a quarter-mile oceanfront promenade lined with restaurants, bars, and spectacular views. Indulge in more than 25 dining experiences, including three new, dedicated seafood venues. And enjoy dazzling Broadway performances - Rock of Ages, Burn the Floor, and Cirque Dreams & Dinner Jungle Fantasy. Norwegian Breakaway offers magnificent amenities at sea. Serving a wide variety of culinary delights to please every palate, our complimentary dining options include three main dining rooms, a help-yourself buffet and a variety of casual cafés, grills and on-the-go choices. Plus, our Main Dining Rooms offer a menu that changes daily, Chef's Signature Dishes and carefully selected wine recommendations, guaranteeing a different culinary adventure with every visit. Enjoy a night of gastronomic proportions at one of our many speciality restaurants. Find your inner foodie at Ocean Blue featuring delicious seafood eats. Bring a hearty appetite to our Brazilian steakhouse, Moderno Churrascaria. And see shrimp fly at Teppanyaki. Whether you're dining inside or oceanside on The Waterfront, our speciality restaurants feature the tastes you'll crave. With so many bars and lounges to discover, finding your favourite may take a few days. Feel the energy of the pumping music and pulsing walls as you dance till the wee hours at Bliss Ultra Lounge. Grab a burger and beer anytime you like at O'Sheehan's Neighborhood Bar & Grill. Or chill out, literally, in the only ice bar at sea. Whether you're looking to meet up with friends or make new ones, there's always an opportunity to mix it up. From top to bottom and from bow to stern, Norwegian Breakaway has enough onboard activities to fill every minute of your cruise. Think you're brave? Splash around at Aqua Park with Free Fall - the fastest waterslides at sea. Or visit our multi-level Sports Complex and walk The Plank, which extends 8 feet over the side of the ship. Wanna get lucky? Bet it all at our award-winning Casinos at Sea®. With so much excitement, you'll have to come back for more. Forget to pack something? No worries! Our gift shops onboard carry everything you'll need for fun in the sun. Shop from a variety of souvenirs, cosmetics, clothing, snacks and sundry items. Treat yourself at our duty-free shops full of fantastic savings on fine jewellery, accessories, perfume, liquor and tobacco. The full deposit on this holiday is £50pp and the balance is due 14 weeks before departure.